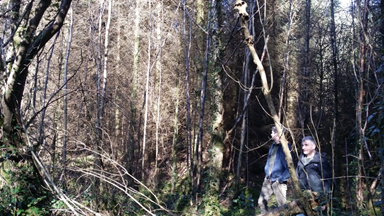 The forest site is situated near the town of Borris in South Co. Carlow. This part of Carlow is influenced by the River Barrow and also the Blackstairs Mountains to the East. The site is part of the 110 ha farm owned by Peter Rose. Peter is mainly involved in suckler cow farming for beef production and commercial farm forestry. Almost half of the total farm area (approx 50ha) has been planted under forestry through the Afforestation scheme. The forest area comprises average sized farm forestry blocks (6ha) ranging in age from 10 years to 26 years old and has a wide range of species including Sitka spruce, Norway spruce, Douglas fir, Larch, Scots pine and hardwoods of ash, sycamore and oak. Forestry operations here are influenced by the fact that the plots are within a Freshwater pearl mussel catchment area. We will be looking at a six hectare, 26 year old SS/NS plot that has received a 2nd thinning intervention and is in the process of CCF transformation. The second part of the day will be looking at a 20 year old SS/NS stand that has had a 1st thinning. Here we will carry out a marking exercise that will allow participants to actively select trees for removal. The day will be led by Pro Silva Ireland committee member Manus Crowley with input from other committee members who actively manage CCF sites around Ireland. We will also be joined by Huw Denman of SelectFor (www.selectfor.com ). Huw is a forest manager based in West Wales. He has direct experience in the transformation of upland commercial forestry plantations and has studied the application of CCF principles abroad. He has a background in harvesting and marketing and in forest certification. Huw is no stranger to Ireland and Irish forestry and has been, along with his Selectfor colleagues, a close supporter of Pro Silva Ireland over the years. He has also worked professionally in Ireland for many years in private forest management, training and certification. 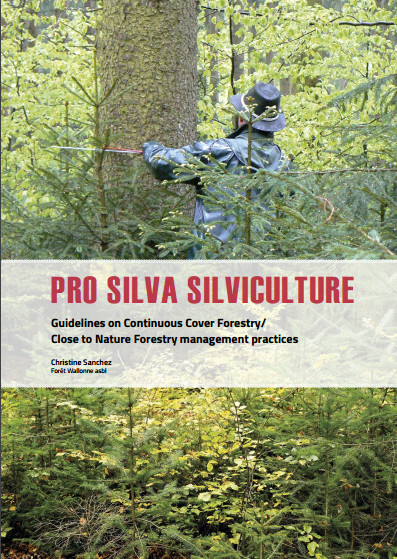 During the day we will be launching a new booklet called “Pro Silva Silviculture” which provides very practical guidelines on implementing continuous cover forestry and close to nature forestry management practices. We are very proud of this new publication which was originally produced by our friends in Wallonia and has been translated into English with financial assistance from the Forest Service in the Department of Agriculture, Food and Marine. The new guide can be purchased online here! Participants should bring a packed lunch and be dressed for the outdoors! As usual at Pro Silva Ireland field days we will be collecting a voluntary contribution (suggested as €20) towards the running of field days and other events.